Before we start today, I need to apologize to some of our friends for some misunderstanding. Some of our Arab brothers and sisters have somehow accused me of attacking the Arab world throughout this site on different occasions. I have never ever planned to attack any special person, nation or religion. I love and respect all and do not support the policy of taking revenge. I am not that kind of person to break somebody in order to gain others’ support or favor. I have mentioned what I assume is true about the background of Iran-Arab relation in history as well as its effect on Persian language. I think to enter into somebody’s home by force is called invasion, be it for the sake of religion, democracy or any other ideas. I never said we should kill all Arab people because they took Iran under their control long time ago. On the contrary, I have mentioned that we should learn to forgive and love others. You the Arab people are my brothers and sisters and I love you all as I love other nations. Please accept my sincere apologies if there has been some misunderstanding and if you think I purposely attacked the Arab people to make others happy. I am your mirror. Do not break me! As you know, we are approaching October 19. Does this day remind you of anything special? I hope it does! October 19 is the day when I was born again, this time online!! Easypersian will become 3 years old on this day! This year, I am going to give you a very unusual and rare gift! I don’t know what you are going to give me in return! What else a poor man like me has got to give away for friends if not his own properties?! And what property I have but my own website?! No, don’t get excited! I am not going to give away my website! But I have something on this web page for you. Guess what? Yes, you are right! My CDs!! I am going to offer special discount for Easypersian Website on CD this year. This is a mutual cooperation and I hope you will accept it. I really wish I were able to give a free copy of this CD to each one of you. Unfortunately, this is not possible for me to give away 45000 CDs for free! What I can do for you is to break the price. I will never become a businessman! For 15 days (October 15 – October 30), you may purchase the website CD for 29 dollars only. This is a help to those students who are studying Persian for the sake of their Persian ancestors!! Just remember, this offer will remain valid for only 15 days!! Don’t miss this opportunity or you will regret it! As for music CDs , I am going to change the price for the sake of the music enthusiasts who love music but cannot pay this much! So far, I have mailed the music CDs to you with their translation. From October 15 on, the translation of the songs will not be mailed to you with the CDs. When you order any of the music CDs , you will have immediate access to all songs as well as to their translation! I will send you the songs (in MP3) and their translation (in PDF) through internet and you may download the songs and print their translation by yourself . So, you do not have to wait for some one week to receive the parcel. I will mail the CD immediately after I receive your order. You will have immediate access to the songs and their translation. You will receive the CD in almost one week upon your order. Are you willing to pay me more for such a service? Thanks for your generosity! I don’t want more although I desperately need it! Just on the contrary, I am going to cut the price down! So, how much should you pay for each CD? Only 17 dollars for each music CD! Nothing for shipping. Could anyone say “dastet dard nakoneh, Hassan”? I deeply hope you will accept this as a gift on the third birth anniversary of our site. NOTE: The original website for Yahyaa is no more available online and I have no idea what happened to it. 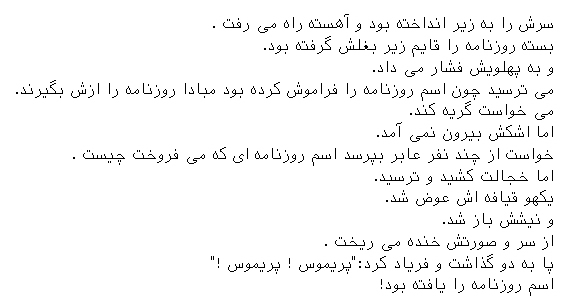 Therefore, I have made the texts available on easypersian.com for you to use. The problem here is that we miss parts of the original work, which is not a big deal but affects the the way the story of Yahyaa is going. When I first wrote these lessons about Yahyaa, I was addressing to François and his web page. He is gone and all you need to remember today is that there was once a François who had made these few lessons dynamic!! I wish him all the best. Thank you for your understanding – and my special thanks to those students who told me about the missing Yahyaa! Dastetun dard nakoneh! All right, now let’s get started. Today, we will finish the last part of our translation discussions on Yahyaa. I am really happy that you liked lesson 109. Thank you very much for all your warm messages. Please Right-click on the link below and choose ‘Save Target As’ to save the sound file into your computer. thanks for the lessons, I wished you were explain the 1st, 2nd,3rd, 4th parts of the story like this lesson..
hi…thanks for the lessons, I wished you were explain the 1st, 2nd,3rd, 4th parts of the story like this lesson..